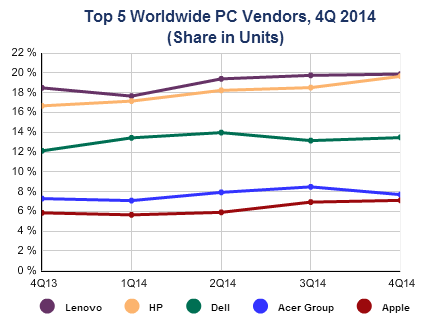 Smaller declines in personal computer sales around the globe are a welcomed change. Worldwide PC shipments totaled 80.8 million units in the fourth quarter of 2014 (4Q14), that's a year-on-year decline of -2.4 percent, according to the latest market study by International Data Corporation (IDC). Total shipments were slightly above expectations of -4.8 percent growth, but the market still contracted both year on year and in comparison to the third quarter. IDC reports that although the holiday quarter saw shipment volume inch above 80 million for the first time in 2014, the final quarter nonetheless marked the end of yet another difficult year -- it was the third consecutive year with overall volumes declining. On an annual basis, 2014 shipments totaled 308.6 million units, that's down by -2.1 percent from the prior year. Besides, the forward-looking trend doesn't indicate any meaningful improvements. Although the U.S. and Europe remained stronger than other markets, growth in these mature regions slowed from earlier in the year. Asia-Pacific (excluding Japan) continued to strengthen, seeing only a very slight increase in volume. Similarly, commercial demand, which boosted growth earlier in the year, has slowed while consumer demand is gradually returning. That said, the overall market has been fueled by low-priced systems, including growth of Google Chromebooks and new promotions of Microsoft Windows 8 systems. "The strength from market leaders, as well as improvement in Asia-Pacific and the consumer market more generally, are positive signs for the PC market," said Loren Loverde, vice president at IDC. United States -- the U.S. PC market concentration has increased to 83 percent of shipments coming from the top 5 vendors. Portable PC growth remains strong with double-digit growth from a year ago, while desktop shipments declined by more than -10 percent. Europe, Middle East, and Africa (EMEA) -- PC shipments in EMEA posted a slight increase in the fourth quarter, fueled mainly by strong consumer demand during the holiday season. Political and economic factors, especially unfavourable exchange rates, also negatively impacted numerous countries across the region. Japan -- The market continued to slump following a surge of XP replacements a year ago. Vendors took the time to clear excess inventory in the channel, leading to a lean quarter. Volume fell below 3 million units in the quarter, a drop of -35 percent year on year and its lowest level since the fourth quarter of 2006. Asia-Pacific (excluding Japan) -- APeJ continued to stabilize with growth rising to positive territory following several years of significant declines. Slowing growth in tablets and smartphones as well as promotions of lower-priced Windows 8 + Bing systems helped relieve some pressure on the PC market.